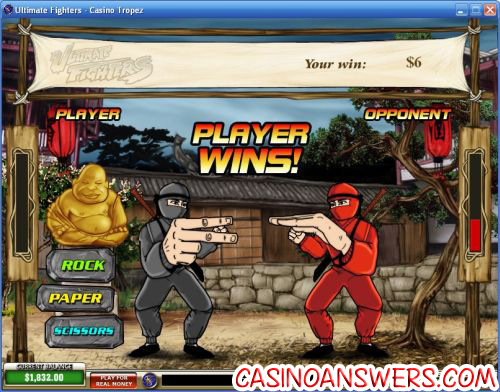 Ultimate Fighters Video Slot Guide & Review - Casino Answers! 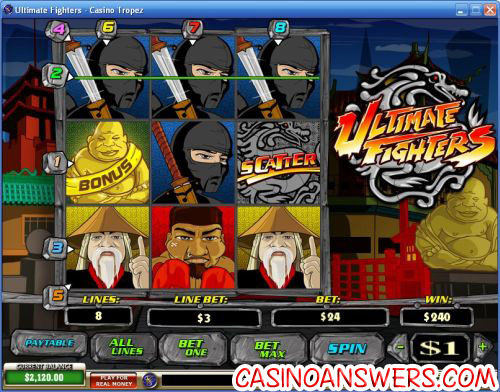 Ultimate Fighters is a 3-reel, 3-row, 8-line video slot machine from Playtech. It features scatter wins and a bonus game. You can find Ultimate Fighters at any Playtech casino such as Titan Casino and Bet365 Casino.Play at this years #1 online casino for United States - Slots.LV. When I first saw the name “Ultimate Fighters,” I was expecting something UFC-related. I had visions of cartoony MMA fighters in my head as I downloaded the game. Instead, I got something totally different. As soon as I saw the logo, I knew this wasn’t a UFC video slot, but rather a Street Fighter video slot. Now, I like Street Fighter as much as the next guy, but this was not what I was expecting. Many of the symbols in Ultimate Fighters are Asian-themed such as the ninja, the sensei, the assassin and the Buddha bonus symbol, but others are obviously inspired by Street Fighter. You can see Guile, Balrog, E. Honda, Chun-Li and a Ryu/Ken hybrid. The assassin chick is ever elusive. If you can manage to get a 3X hit of her, you will be awarded 5000X your line bet. Ultimate Fighters has a decent range of coin values, which are $0.01, $0.05, $0.10, $0.25, $0.50, $1, $2 and $5. Next, you must decide whether to bet 1, 2 or 3 coins. To bet one, hit “Bet One.” To bet two, hit the button again. To bet three and spin the reels, hit “Bet Max.” You can set the number of lines you wish to play by clicking on the numbered tabs on the left and top of the video screen. To play all of the lines, hit the “All Lines” button. We recommend playing all lines on the Ultimate Fighters video slot, as you don’t want to see any big wins on an unselected line. Ultimate Fighters makes for a great penny slot, as well as for high rollers who wish to bet as much as $120 on a spin. The Ultimate Fighters slot machine features scatter wins. The scatter symbol rather unimaginatively reads “Scatter” in the Street Fighter font. The minimum number of scatter symbols required for a winning combo is four. If you are lucky enough to get a screen full of scatter symbols (nine), you will win 1000X your bet. Scatter symbols do not need to be in a row to count as a win. If you three gold Buddha bonus symbols appear, you will trigger the Ultimate Fighter bonus game. You’re taken to a stage straight out of a Street Fighter game. But instead of fighting, you must defeat your opponent in a battle of… Rock-Paper-Scissors! Don’t worry if you lose the first round – it’s best 2 out of 3. Ultimate Fighters is a little unconventional for a video slot, but is still a lot of fun. I often enjoy playing branded slot machines and while this is not an official Street Fighter video slot, being inspired by Street Fighter is close enough. It lacks wild symbols and free spins, so if you like to have those in your video slots, you may want to look elsewhere. I would have rather the bonus game had been a simple fighting game rather than a Rock-Paper-Scissors game, but the end result is the same. If you’re looking for a place to play Ultimate Fighters, you can a special 200% up to $400 signup bonus on slots at Bet365 Casino. Where can I find a US-friendly casino that has the Ultimate Fighters video slot? Unfortunately, none of the Playtech casinos that offer Ultimate Fighters accept US-based casino players. If you’re looking for some other great slots to play, you can get a 100% up to $550 slots signup bonus plus $5 free to play at Silver Dollar Casino. Is there an official Street Fighter slot machine? You can play two different officially licensed Street Fighter slot machines at InterCasino. Does the Ultimate Fighters slot machine have a bonus game? Yes, it’s based on a Street Fighter game stage. However, instead of fighting, you are the black ninja playing a game of Rock-Paper-Scissors with a red ninja. You must choose Rock, Paper or Scissors. He will choose one of the three as well. If you are unfamiliar with Rock-Paper-Scissors, the rules are: Rock smashes Scissors; Paper covers Rock; Scissors cut Paper. Where can I play the Ultimate Fighters slot? Are there any UFC slot machines? Is there a UFC casino?